Another cyclone made landfall in war-ravaged Yemen's Socotra island Sunday, causing panic as a minister posted an "urgent appeal" to save residents from the second tropical storm in a week. At least two people were killed and dozens injured, a government source said. Heavy winds, rain and flash floods swept through Socotra as the storm, named Megh, hit the island, already badly battered by last week's cyclone Chapala, residents said. Fisheries Minister Fahd Kavieen, who is from Socotra himself, urged the United Nations and neighbouring Oman to "urgently intervene with emergency teams to save residents" on the island "which is now facing a cyclone stronger than Chapala". The Arabian Sea island is 350 kilometres (210 miles) off the Yemeni mainland. The World Meteorological Organization (WMO) spokeswoman Clare Nullis said Friday that Megh is not as powerful as Chapala, which had killed eight people in southeast Yemen. 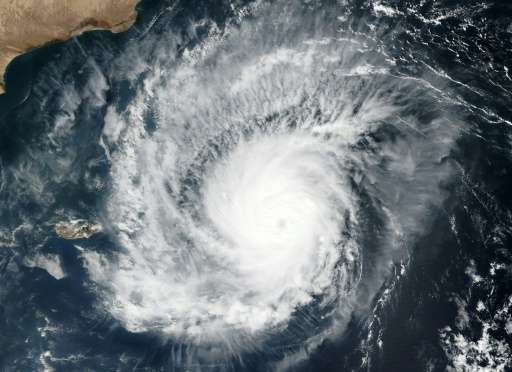 But Socotra resident and humanitarian activist Abdulrauf al-Juhaimali differed, telling AFP on Sunday that "this cyclone is stronger than Chapala". The government source gave a provisional toll of two dead, a man and a woman when their homes collapsed, and said there were also "dozens of injured". Many people who had returned to seafront homes already destroyed by Chapala fled again to government buildings on higher ground as heavy flooding hit once more, he said. Tropical cyclones are extremely rare over the Arabian Peninsula, and two back-to-back was "an absolutely extraordinary event", said Nullis. The UN's humanitarian agency OCHA said on Friday that up to 44,000 people had already been displaced by Chapala, which hit mainland Yemen on Tuesday, triggering heavy flash floods and mudslides. Chapala had forced the evacuation of 18,000 people on Socotra and completely destroyed 237 homes, according to OCHA spokesman Jens Laerke. No one on the island was killed, despite initial reports of three deaths, he said. OCHA had set up a special 11-man support and response team, based in Oman, to help relief efforts, Laerke added. More than 900 UN staff are already on the ground in Yemen to help respond to the needs after Chapala, but also because of the conflict plaguing the country.